I've actually been looking forward to this review for a while, I've loved experimenting with this product! Claim: "As a strengthener, it provides an intensive treatment and will help nails become noticeably stronger within 2 weeks. The treatment contains horsetail, a healing herb rich in nutrients and high in silica, proven to help natural nails grow faster and stronger. As a base coat this treatment prepares the nail surface for optimum nail lacquer application and contains incredible adhesion properties that improve nail lacquer wear. Lastly as a top coat, the 3 in 1 provides an extremely high shine finish and maximizes the wear characteristics of nail lacquer. As a strengthener only, apply treatment to a clean and dry nail 2-3 times a week for approximately 2 weeks. This intensive treatment will deliver results within 2 weeks of regular use and help promote the growth of strong and healthy nails." Scent: Common nail polish scent. Packaging: In LOVE with the packaging! 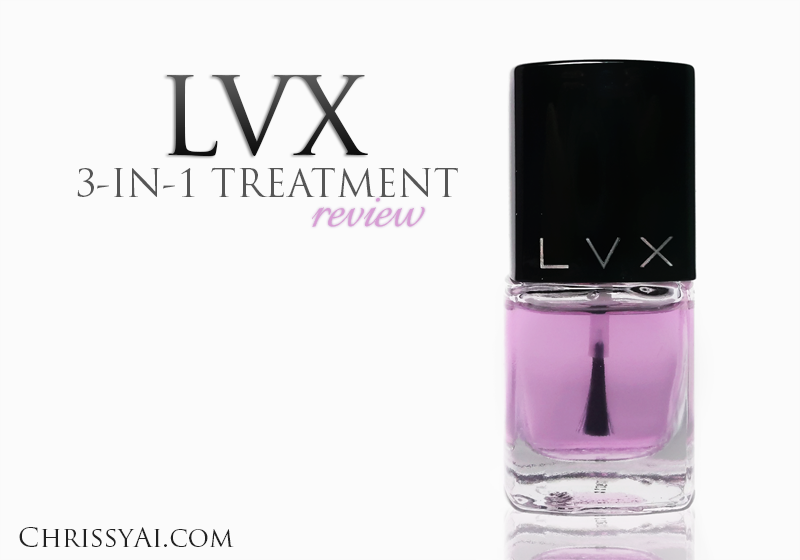 One of the many things that has me loving LVX is the packaging of their nail polish. I love the cap that goes over the polish handle and the modern square-like design of the bottle. The glass seems very thick and durable, the handle is easy to hold and paint with, and the bottle is space efficient. Texture: The texture is smooth and gives a glossy finish on the nail and over polish. The treatment is thin and spreads extremely effortlessly with very little product needed. Conclusion: I'm really loving this treatment! I mainly use it as a base coat and strengthener and it does better at preventing stains than any other base coat that I've tried. As a top coat, it gives a really nice shine, great longevity, and has a decent dry time. It doesn't dry as fast as my OTD top coat but I wouldn't classify it as slow by any means. For the purpose that I use it for, it works perfectly. I love the slight purple tint (more evident in the bottle shots) and how easily it applies. It is on the pricier side so it may not be ideal for someone on a budget. However, I would definitely recommend that if you can afford it, get it! You get what you pay for! Interesting! And does is actually strengthen your nails? My nails would break a lot before I started using my Sally Hansen Hardener. I've since replaced that with this and it's doing a great job at prevent breaks. :) It's not as easily for me to tell because I change what's on my nails a lot, but even with the time it is on I do notice my nails are staying strong!